The demand for biodegradable stents has grown significantly with the development of newer technology that has reduced the risk of thrombosis, dual anti-platelet therapy, in-stent restenosis, and second surgery for removal of the stent. Therefore, the introduction of biodegradable stents with advanced technologies has boosted its demand and have gained larger customer base. Moreover, various cardiologist and patients have shown keen interest for using biodegradable stents for coronary and peripheral artery diseases treatment. These factors are responsible for the significant growth of the biodegradable stents market across the globe. The global biodegradable stents market is projected to rise at staggering 30.1% of CAGR during the forecast period between 2016 and 2024. Rising at this growth rate, the market is expected to reach a valuation US$1.7 bn by the end of 2024 progressing from US$0.18 bn calculated in 2015. The global biodegradable stents market is categorized on the basis of material, stent type, and end user. Based on stent type, the market is bifurcated into peripheral artery stents and coronary artery stents. Of these two, coronary artery stents held the maximum share in 2015. Over the coming years, the demand for coronary artery stents is likely to increase because of rapid growth of deaths due to cardiovascular diseases across the globe. Moreover, rising use of stents and growing preference of cardiologists to perform percutaneous coronary intervention procedures is expected to trigger the demand in the biodegradable stents market. Based on material type, the global biodegradable stents market is bifurcated into polymer and metal. Moreover, in terms of end-user, the global biodegradable stents market is divided into cardiac catheterization laboratories, hospitals, and ambulatory surgery centers. On the regional front, the report on the global biodegradable stents market is categorized into Latin America, Europe, North America, the Middle East and Africa, and Asia Pacific. Among these regions, Europe held maximum shares in the global market in 2015. During the forecast period, this region is likely to rise at staggering 27.2% CAGR between 2016 and 2024. Moreover, recent approvals from the U.S.FDA is likely to grow the North America biodegradable stents market in the forthcoming years. On the other hand, the demand for biodegradable stents is likely to grow in Asia Pacific due to uptake of newer technologies. Growing prevalence of hypertension and diabetes in this region is likely to boost the demand for biodegradable stents, as patients suffering from these conditions have high possibility to get cardiovascular diseases. Most importantly quick approvals from regulatory bodies in Asia Pacific is also driving the biodegradable stents market. In the competitive landscape, the report includes some of the key players operating in the global biodegradable stents market. Boston Scientific, Inc., Abbott Laboratories, Elixir Medical Corporation, Kyoto Medical Planning, Biotronik, Terumo Europe NV, and Sahajanand Medical Technologies are some of the prominent players in the global biodegradable stents market. Biodegradable Stents are the third generation of stents used in the treatment of coronary artery diseases, which are completely absorbed in the body after the drug is eluted. The biodegradable stents have emerged as a perfect replacement to the standard Drug Eluting Stents having a permanent polymer coating over them. Introduction of biodegradable stents has resulted into reduction in rates of thrombosis, in-stent restenosis, and dual anti-platelet therapy required with the DES and Bare Metal Stents, as the polymer or metal is completely absorbed in the vessel, resulting into efficient drug delivery, and vascular restoration. Players in the stents market are now looking beyond the coronary and peripheral artery disease treatment applications of the biodegradable stents after various clinical trials which have demonstrated the efficiency of these biodegradable stents in other vascular interventions. The market overview section of the report comprises qualitative analysis of the overall biodegradable stents market considering the factors determining the market dynamics such as drivers, restraints and opportunities, along with Porter’s five force analysis and market attractiveness analysis. In addition, market opportunity analysis for the stent type, and material types, and key industry developments has also been provided. Key industry developments include the major events occurred in past decade and are expected to occur during the forecast period which are likely to affect the market dynamics. 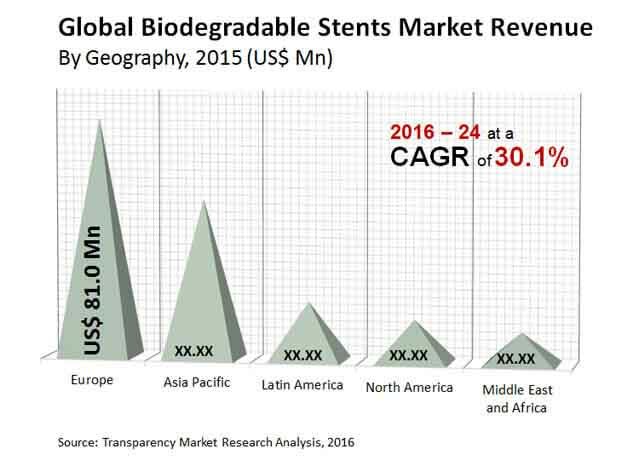 The global biodegradable stents market has been segmented on the basis of stent type, material and end users. On the basis of stent type, the global market is categorized as coronary artery stent, and peripheral artery stent. Moreover, on the basis of material, the biodegradable stents market has been segmented into polymer based, and metal based stent. Furthermore, on the basis of end users, the global biodegradable stents market has been classified as hospitals, cardiac catheterization laboratories, and ambulatory surgery centers. The market for these stent types, material and end users has been extensively analyzed on the basis of factors such as usage pattern, sales revenue, geographic presence and technological developments. The market size and forecast in terms of revenue (USD million) for each of these segments have been provided for the period 2014 to 2024, considering 2015 as the base year. The report also provides the compounded annual growth rate (CAGR) for each segment for the forecast period 2016 to 2024. Geographically, the biodegradable stents market has been classified into five segments namely, North America, Europe, Asia-Pacific, Latin America, and the Middle East & Africa. The market size and forecast for each region has been provided for the period 2014 to 2024, in terms of types, material and applications, along with the CAGR (%) for the forecast period 2016 to 2024. The report also provides a section on the competitive landscape, wherein the market share analysis of leading players in the global biodegradable stents market, in terms of percentage share in 2016 has been discussed. A list of recommendations has also been included for new entrants as well as existing market players to help them establish a strong presence in the market and increase their market share. The report concludes with the profiles of major players in the global biodegradable stents market such as Abbott Laboratories, Boston Scientific, Inc., Terumo Europe NV, Biotronik, Elixir Medical Corporation, Sahajanand Medical technologies, and Kyoto Medical Planning among others. The major market players are evaluated on various parameters such as company overview, financial overview, product portfolio, business strategies and recent developments.